Evidently a case of different supermarkets, different product ranges. 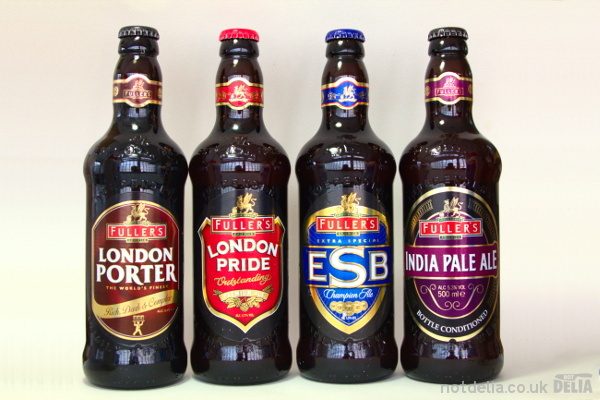 And given the opportunity to snap up these four from the Chiswick-based Fuller’s brewery (known in full as Fuller Smith & Turner), how could I possibly pass it up? 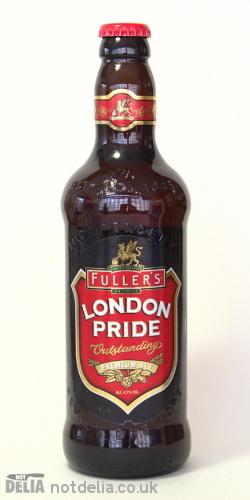 Pride in its bottled guise weighs in at 4.7% ABV, quite a bit stronger than its cask version (4.1%) and certainly stronger than the average London bitter. It’s quite hoppy, almost floral in its aroma; initially it’s fairly fruity when you come to drink it, but it becomes quite bitter and dry in the mouth at the finish. 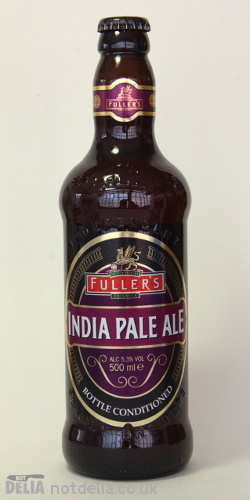 Fuller’s IPA is apparently produced mostly for the US market, although some bottles are sold in the UK and it’s available in cask at Fuller’s tied pubs across southern England. The aroma’s a bit sweeter than Pride’s, but the finish is sharper and tangier than Pride; it’s a little hazy too, and it leaves noticeably more brewer’s lace down the glass than any of its stablemates here. Again, it’s somewhat stronger than typical UK cask IPAs (including its own cask expression), at 5.3% ABV. 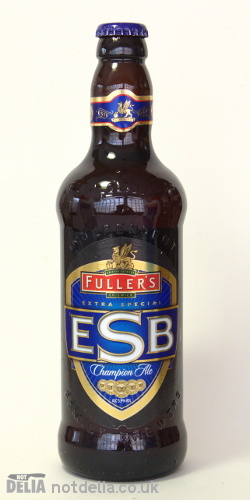 For years I thought (without bothering to check) that ESB stood for “Extra Strong Bitter” rather than “Extra Special Bitter”. It is strong, at a respect-commanding 5.9% ABV. Although it shares some of Pride’s fruitiness, there’s more toffee and caramel present in the flavour, which also comes through as more body and smoothness. Towards the end that toffee turns to liquorice or black treacle. No wonder it’s been the CAMRA Beer of the Year an unsurpassed three times. 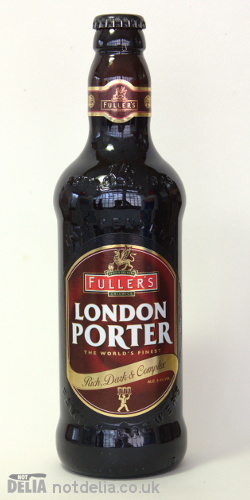 Porter’s enjoyed a bit of a revival in recent years, after several decades in the latter half of last century where the gradual weakening of stout meant that it was edged out of its niche. At 5.4% ABV, it’s rather stronger than draught Guinness, which is just 4.1%-4.3% these days. Yet somehow it seems lighter and less bitter. Four very nice ales. Funny that the bottled versions should be stronger than the cask versions, but there you are. At least you don’t have to worry about not being able to make your way home without falling over.